This is the revolutionary piano app to support the practice of playing chords. This app can display each note of the component tones (root, triad, 7th, tension, on chord) of selected chord on the keyboard, play chord sound. In addition, it has 6 octaves keyboard, and it can display immediately the chord name to match the configuration notes you pressed. 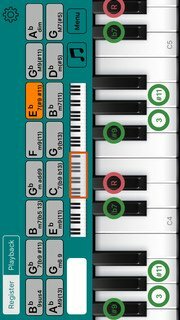 As the main features of this app, it has the function to play chords as sequencer of up to 16 bar. This app supports you when you practice the songs that are configured in the chord such as popular music and jazz. Enter the chord from the keys on the screen. Create a chord by selecting each items from the chord selection screen. This app supports Core MIDI. You can perform it by connecting a MIDI-compatible keyboard. If you'd like to input or display all the chord patterns including tension (b9, # 9, 11, # 11, b13, 13), You need In-App Purchase. We'll update this app to help you in the future.